Red Hat OpenStack Platform offers the innovation of the OpenStack community project, while also providing the security, stability, and enterprise-readiness of a platform built on Red Hat Enterprise Linux. Red Hat offers services for each major release of Red Hat OpenStack Platform. Red Hat OpenStack Platform 3 offered with 1 year of Production support. Red Hat OpenStack Platform 4 offered with 1.5 years of Production support. Red Hat OpenStack Platform 11 offered with 1 year of Maintenance Support support. Red Hat OpenStack Platform 12 offered with 1 year of Maintenance Support support. 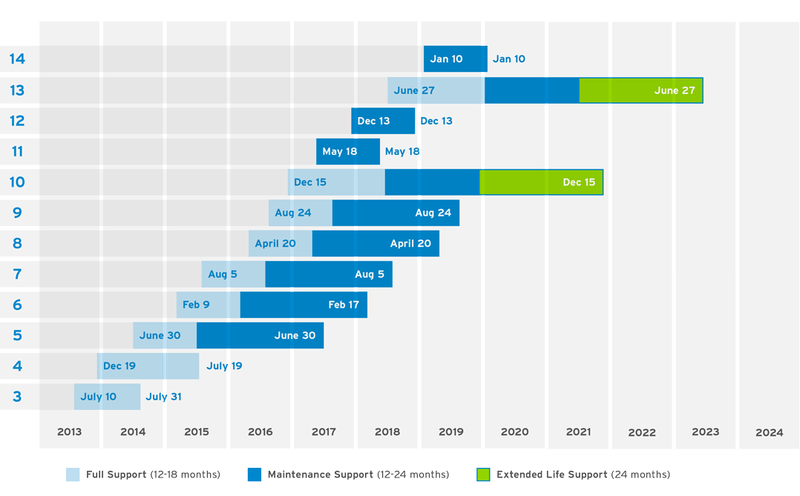 Red Hat OpenStack Platform 13 offered with 3 years of Production support and the option to purchase an extended lifecycle support (ELS) for 4th and 5th years, divided into sequential phases: Full Support (18 months) and Maintenance Support (18 months) and ELS (24 months). Red Hat OpenStack Platform 14 offered with 1 year of Maintenance Support support. Note: Production support will vary depending on the version starting with Red Hat OpenStack Platform 10. Red Hat OpenStack Platform is available as its own product offering and as a component delivered as part of the Red Hat Cloud Infrastructure and Red Hat Cloud Suite solution offerings. The above support life cycle for Red Hat OpenStack Platform applies to both the stand-alone product offering and to the component when delivered as a part of the Red Hat Cloud Infrastructure and Red Hat Cloud Suite solution offerings. Software changes to Red Hat OpenStack Platform are delivered through individual updates known as errata advisories. These advisories are delivered through the Red Hat Customer Portal or other authorized portals. Errata advisories can be released individually on an as-needed basis or aggregated as a minor release. Errata advisories may contain security fixes (Red Hat Security Advisories or RHSAs), bug fixes (Red Hat Bug Fix Advisories or RHBAs), or feature enhancements (Red Hat Enhancement Advisories or RHEAs). All errata advisories are tested and qualified against the respective, active Red Hat OpenStack Platform major release. All released errata advisories remain accessible to active subscribers for the entire Red Hat OpenStack Platform life cycle. Within each major release of Red Hat OpenStack Platform, any errata advisory (including one released as part of a minor release) will be applied cumulatively to the latest release of Red Hat OpenStack Platform, including any patch sets. During the life cycle of a major release, Red Hat makes commercially reasonable efforts to maintain binary compatibility for the core runtime environment across all minor releases and errata advisories. If necessary, Red Hat may make exceptions to this compatibility goal for Critical impact security or other significant issues. NOTE: No components of Red Hat OpenStack Platform are excluded from Extended Life Support phase. 1. Technical Support depends on the service level included in your Red Hat OpenStack Platform or Red Hat Cloud Infrastructure subscription agreement. 2. Red Hat may choose, as a temporary measure, to address catastrophic issues with a significant customer business impact with a hotfix while the Red Hat Bug Fix Advisory (RHBA) is being created. 4. Extended Life Support service subscription is valid only for existing infrastructure and does not cover new installations of the product. 5. At the end of Full Support, or 90 days after the latest major release of Red Hat OpenStack Platform, whichever is later, Red Hat will stop processing certification requests made against the previous release. Any certification request made after this time should be aligned with the latest version of Red Hat Openstack Platform. During the Production Phase, qualified Critical and Important Security Advisories (RHSAs) and urgent and selected High Priority Bug Fix Advisories (RHBAs) may be released as they become available. Other errata advisories may be delivered as appropriate. If available, select enhanced software functionality may be provided at the discretion of Red Hat. Maintenance releases will also include available and qualified errata advisories (RHSAs, RHBAs, and RHEAs). Maintenance releases are cumulative and include the contents of previously released updates. The focus for minor releases during this phase lies on resolving defects of medium or higher priority. Select Bug Fix Errata (RHBA) only. Qualified Critical and Important Security Advisories (RHSAs) only. Valid for existing environments only. Cannot be applied to new installations of the product on hardware or in combination with technologies which have not been certified with the version of the product, or its underlying RHEL components, as they were at the end of Maintenance Support. For more information on Red Hat OpenStack Platform Extended Lifecycle Support refer to the Frequently Asked Questions document. Our official deployment and management tool is part of Red Hat OpenStack Platform release and therefore it has same support criteria as the core product. For detailed information relating to the Red Hat Openstack Platform director, see the Red Hat OpenStack Platform Director Life Cycle support policy page. Any installers which were released before Red Hat OpenStack Platform director became the official deployment and management tool (version 7) are no longer supported (end of life). Red Hat also provides documentation guidance on manual upgrade procedures if the upgrade via Red Hat OpenStack Platform director is not available 4, and, since version 11, independent upgrade scripts for each service are provided in the form of Ansible playbooks which could be reused outside of director. Please refer to the individual product documentation for install or upgrade procedures. Red Hat does not support updating from an alpha, beta, release-candidate, or other pre-release build. 1. The first automated upgrade path is from Red Hat Enterprise Linux OpenStack Platform 7 to Red Hat OpenStack Platform 8. 2. For example, the process would support upgrading from Red Hat OpenStack Platform 7 to Red Hat OpenStack Platform 8, but not upgrading from Red Hat OpenStack Platform 7 to Red Hat OpenStack Platform 9. In that case the upgrade would have to be performed version by version (7 to 8 to 9). 3. In the case of one year releases, the upgrade needs to be performed within one year of the release date of the earlier Red Hat OpenStack Platform version. 4. Including all releases before Red Hat Enterprise Linux OpenStack Platform 7. Red Hat's support for in-place rolling upgrades between sequential releases requires the ability for the control plane to be running the new release (N+1) while compute nodes continue to run the old release (N). This isn't currently possible when the versions involved are more than one release apart. Customers who wish to take advantage of the long-life option to move from one long life release to the next (e.g., Red Hat OpenStack Platform 10→13) will involve an in-place “fast-foward” style of upgrade. This upgrade will be available for testing only at or shortly after the general availability (GA) of Red Hat OpenStack Platform 13. Sometime after GA, when enough testing has been completed, the fast forward upgrade method will be supported. The following section outlines the versions of the Red Hat OpenStack Platform, Red Hat Enterprise Linux and Red Hat Enterprise Virtualization Hypervisor module (qemu-kvm-rhev) alignment. Each Red Hat OpenStack Platform version 1 supports only one major release version of Red Hat Enterprise Linux with all their minor version update releases. As such while you may continue to use existing versions, you must update to the latest version of Red Hat Enterprise Linux minor release to continue to consume new bug fix and security errata. New deployments of the latest Red Hat OpenStack Platform bits need to be based on top of the latest Red Hat Enterprise Linux minor release of given major supported version. Red Hat Virtualization Hypervisor versioning is aligned with the Red Hat Enterprise Linux version that it is based on. When a new Red Hat Enterprise Linux minor version update is released then the aligned Red Hat Virtualization Hypervisor build supersedes the previous versions. Since the versioning is aligned, Red Hat Virtualization Hypervisor version support applies the same requirements as explained in the Red Hat Enterprise Linux Version Support section. The Red Hat Virtualization Hypervisor is not available via the Red Hat Enterprise Linux Extended Update Support (EUS) offering. NOTE: Red Hat OpenStack Platform does not offer Extended Update Support (see http://www.redhat.com/products/enterprise-linux-add-ons/extended-update-support for details). View more details regarding Red Hat OpenStack Platform Support Policies. The OpenStack® Word Mark and OpenStack Logo are either registered trademarks/service marks or trademarks/service marks of the OpenStack Foundation in the United States and other countries and are used with the OpenStack Foundation’s permission. We are not affiliated with, endorsed, or sponsored by the OpenStack Foundation or the OpenStack community.